The next big ShoWorks version is in development during the 2019 year. Conference and training events will resume next year in 2020. Dates and locations will be annouced as early as December 2019. Thank you! We invite you and your staff to join us this spring for a 3-day intense training workshop on ShoWorks. This conference is open to all ShoWorks users regardless of their experience level - from those who have never laid eyes on the software, to the advanced user seeking to discover new ways to improve and streamline their efficiencies within the program. Every aspect of the program from A to Z will be explored in an auditorium followed by a classroom setting, totaling 14 hours of instructional time, all within the world-class and famous Buffalo Bill Center of the West! "I had several people from other fairs peeking over my shoulder last week. I told them how valuable the conferences were to helping me understand what the program can do. Being a volunteer who doesn't play with my program on a weekly or even monthly basis, your instruction and the break out sessions were so very helpful. The Conference helped me understand ShoWorks and Short-Course helped me really lock it in." Buffalo Bill Center of the West  Cody, WY. Evening social will be held at the hotel. Best Western Premier Ivy Inn & Suites rooms have been blocked until full or Febuary 15th under "ShoWorks Conference" for $105/night = standard, and $110/night = balcony, and $156/night = mini suite. 1800 8th St, Cody, WY 82414 (307) 587-2572. Hotel rooms are also limited so it is advised to book soon! Registration may be made here: https://www.fairsoftware.com/register and is capped due to limited space! Plan on this event being sold out shortly as each year we have reached the limit shortly after registration. Because of this nature we cannot provide refunds nor hold spaces and all reservations must be made online and paid upon registration. 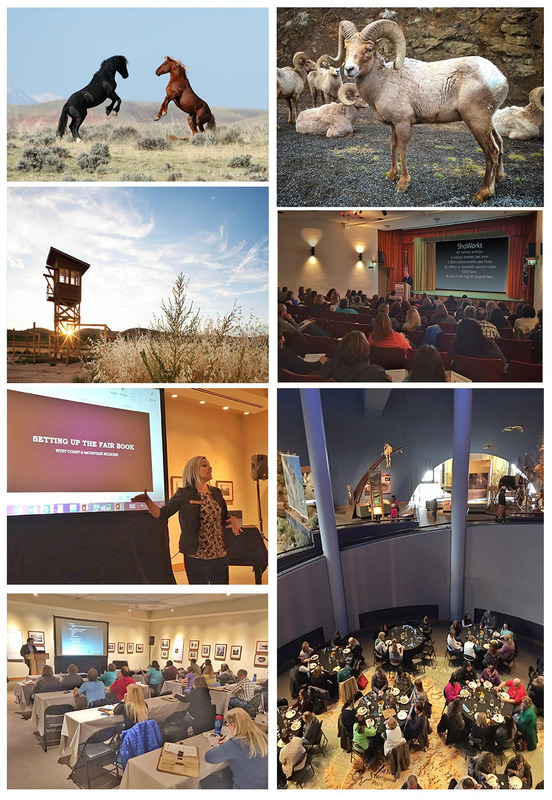 3-days admission to all museums within the Buffalo Bill Center of the West. Shuttle to/from Cody airport/hotel/conference on day before/of/after event. United Airlines and Delta Airlines into Cody's Yellowstone Regional Airport. We have chartered the Cody Shuttle to transport you to/from the hotel and event. Please follow us on our Facebook page for updates. Billings Airport (Montana) is an alternative (and often cheaper), though a 2-hour drive on your own. *Please note that weather and availbility will play a factor. Wildlife Sightseeing Tour - To the Yellowstone East Gate via North Fork Hwy - a scenic shuttle bus drive (1 hour each way, allow 2.5 hrs) to view cliffs and wildlife and granduer of the what Theodore Roosevelt claimed "The most scenic 50 miles in the United States" through the world's first national forest, up to the entrance of the world's first national park. Wild Mustang Tour - A true American wild mustang safari to the McCullough Peaks Wild Mustang Area in effort to catch the mustangs playing, fighting, or relaxing. As with all wildlife viewing, sightings are not guaranteed, but probable. Weather permitting. Binoculars will be furnished. Y-Tex Livestock Tag Factory - Visit the factory of where livestock ear tags, including the RFID compatible EID tags, are made for fairs and shows. 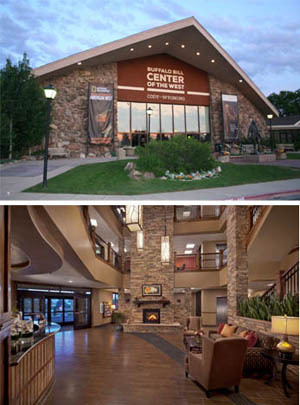 Museum Tour - Take an interpretive walk at leisure through the host of the event at the Buffalo Bill Center of the West. You certainly won't be disappointed!